Volatility refers to “how much price jumps up and down over time.” The VIX is the most widely-followed measure of volatility and serves as a measure for the expected future volatility of the USA’s S&P 500 index. Usually the smaller market cap an asset has the more volatile it will be. Imagine throwing a rock into a small pond. Now take the same rock and throw it into the ocean. The rock will have much more effect on the pond than on the ocean. In the same manner Bitcoin (the small pond for now) is more volatile (i.e. 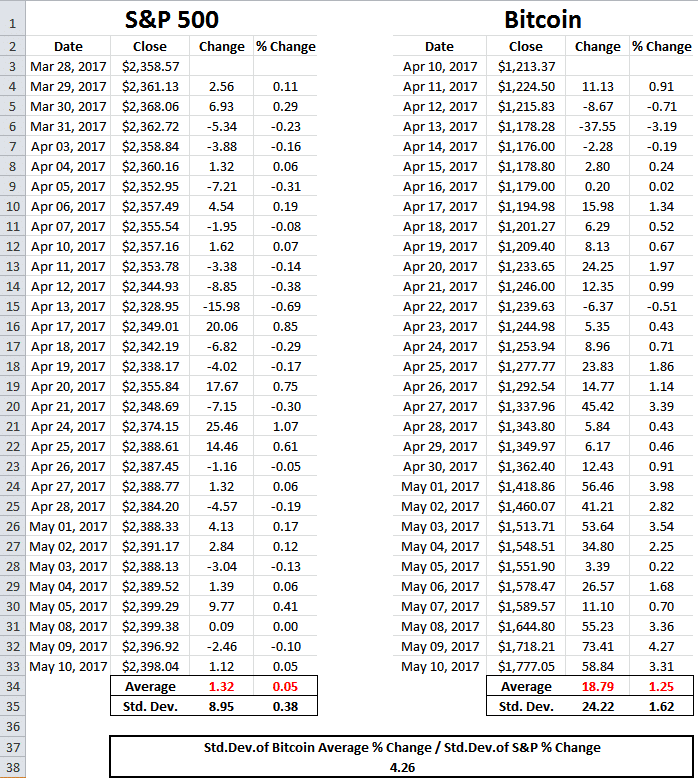 affected) by everyday buy / sell orders (the rock). Volatility is a mathematical measure of the potential size of likely price changes. Relative volatility expectations explain why a 2% daily change in the value of a major currency may shock markets whereas a 4% daily move in Bitcoin is considered fairly standard. BTC (blue line) and Pound (red line) volatility compared. In this post we’re referring to volatility based on historical Bitcoin trading data. 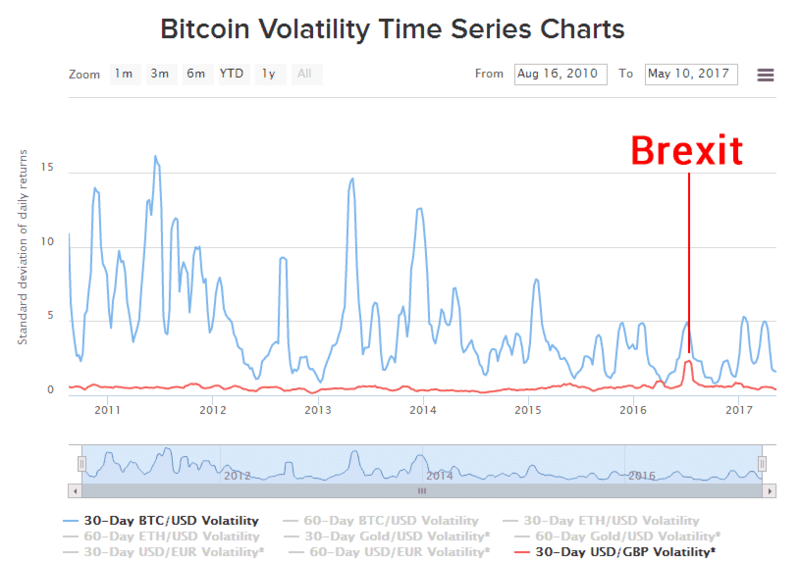 Future – or “implied” – volatility must be calculated based on options data, which for Bitcoin is not yet sufficiently available. That last line concerning risk is particularly significant. While Bitcoin’s volatility is great for traders and even aggressive investors, its risky reputation places it beyond the consideration of more cautious financial players, whether amateur or expert. This “volatility moat” is arguably a good thing. At its present level of development, Bitcoin would struggle to absorb a massive influx of new users or investors. For example, if Venezuela decided to adopt Bitcoin as their national currency, the demand spike would overload the capacity of the existing network. This perception of high risk, whether justified or not, is one of the factors preventing disruptions from excess demand. What this chart reveals is that Bitcoin’s volatility is now surprisingly low and holding steady below the 5% mark since a brief spike in early 2015. A volatility rate which occasionally peaks at 5% on a monthly basis remains far higher than any other major currency, the difference being that Bitcoin is appreciating in value despite high volatility whereas fiat currencies constantly depreciate due to inflation. As one might expect, fiat is far less volatile than Bitcoin, gold is slightly more volatile than fiat and altcoins are far more volatile than Bitcoin. After the low of $891 in late March, Bitcoin is soaring towards $2000 in early May. In a little over a month, Bitcoin’s price has nearly doubled. However, it’s done so in a remarkably smooth manner, with mostly upwards movement without much in the way of downwards corrections or reversals. 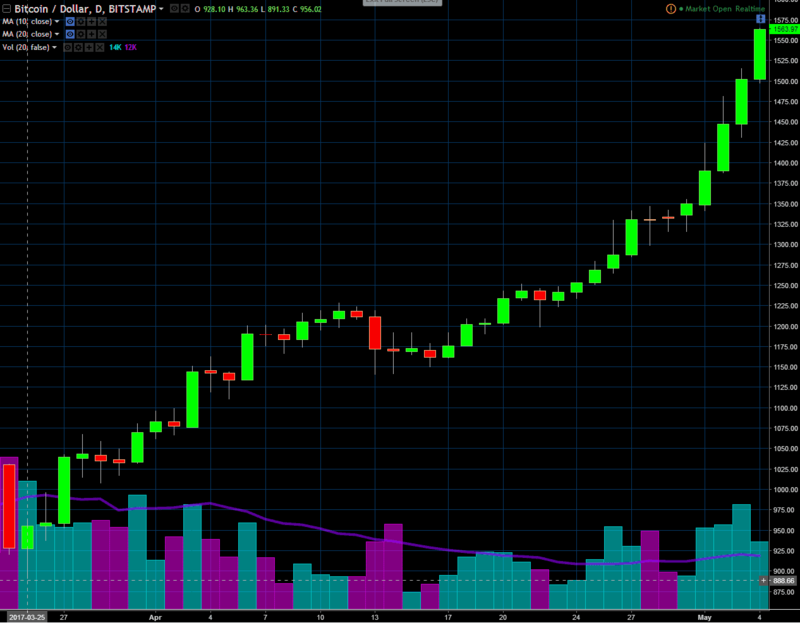 As such, it displays a diminished degree of volatility despite the significant increase in value. Of course, Bitcoin savers aren’t complaining about this price rise, although Bitcoin’s comparatively high volatility does present certain problems – even when it’s upwards volatility! The fact is that Bitcoin has experienced at least 4 boom and bust cycles during its history, and will likely experience more in the future. While price frequently shoots to the moon, slingshots around it and then crashes back to earth, thus far a higher baseline has been established with each cycle (as can be seen in the video below). From this observation follows the hodl principle: given enough time, Bitcoin’s price will inevitably be higher. This view is supported by Bitcoin’s supply and demand model. As bitcoin issuance diminishes over time with each halving event, increasing scarcity should raise the future price. This strategy of long-term holding has proven extremely successful as a counter to volatility so far. That said, there exists a non-zero risk of Bitcoin failing (for a variety of reasons) or being rendered obsolete by some other monetary technology. For nimble traders, high volatility is desirable. Not only does it provide plenty of opportunities for large, fast profits but also lots of buying or selling opportunities within larger trends. That said, traders conditioned to more staid markets will need to seriously adjust their game plan in order to survive in the wild Bitcoin markets. Price volatility may also represent a useful measuring-stick for traders. It is perhaps best visualised in the form of Bollinger Bands. By default, this popular indicator works by drawing lines 2 standard deviations above and below a 21 period moving average of price. 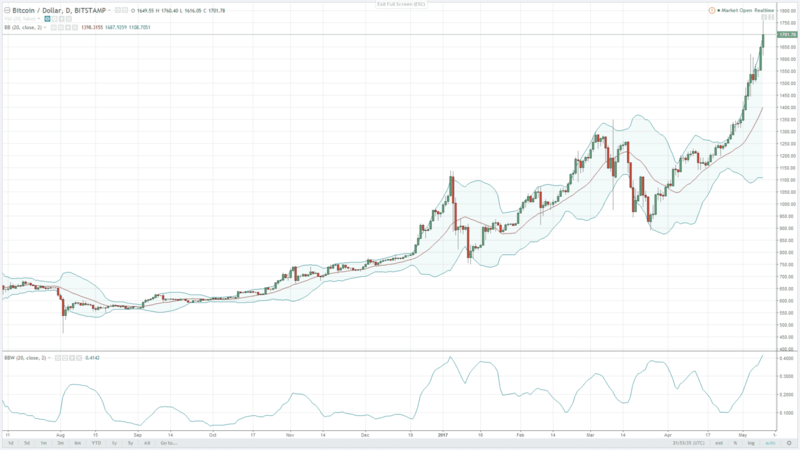 Bollinger Bands frame the extent of the 2 std. dev. blue-tinted area around the moving average. The lower panel displays the width between Bands, although this is easy enough to gauge visually. When the Bands squeeze tightly around price, they signal contraction of volatility. When volatility inevitably picks up, the Bands will expand. Traders then typically put on trades in the direction of the breakout. Bollinger Bands help greatly to visualise volatility, so that it can be harnessed to the benefit of one’s trading and market awareness. Unstable money can make commerce difficult. For this reason, most merchants price their goods in fiat currency, with the Bitcoin price tag automatically adjusted to match. Provided the merchant converts all their earnings to fiat instantly, they have fairly minimal exposure to volatility risks. Those who earn weekly or monthly Bitcoin payments for their services may find that they receive far fewer BTC than expected in the (not unlikely) event of a sudden price rise. In a worst case scenario, Bitcoin price may rocket just before payday then plunge before service providers are able to convert their coins to fiat. For employers, the reverse case is possible, leading to inflated and unpredictable salary costs. Careful and comparatively more complex invoicing is required to prevent such problems. The daily (or perhaps even hourly, during exceptionally volatile periods) average price must be referenced alongside the agreed, fiat-denominated rate per hour or task. It’s a good idea to negotiate such payment arrangements upfront. At its current price level above $1700, Bitcoin’s market cap (price times the number of existent BTC) is roughly $28 billion. This cap is similar to that of several US tech firms traded on the NASDAQ, such as Electronic Arts and Analog Devices (which is determined by the price times the number of issued shares). Of course, these tech companies are quite distinct from the revolutionary currency / commodity which is Bitcoin. Their assumed “similarities” end with the market cap. Both of these stocks have a Beta value fairly close to that of the S&P 500, meaning they are about as volatile as the VIX itself. According to their Beta scores, ADI is 33% more volatile and EA is 13% less volatile. With the monthly historical volatility of the S&P 500 since 1950 measured at 14%, this means Bitcoin is around 4.25 times more volatile than the S&P 500. This makes Bitcoin 3.2 times more volatile than ADI and 1.14 times more volatile than EA. I’m a former futures trader. My keen interest in matters financial, economic and political eventually led me to conclude that the current, debt-based fiat system is broken. It was a natural step from there to investing in gold and, in early 2013, Bitcoin. Although I’m not very technical, I’ve learnt about Bitcoin through study, asking questions, running ecommerce and marketing sites and working as a journalist. I’ve always loved writing and my current focus is on creating guides which inform others about Bitcoin’s advantages. Next articleXcoins Review – is it a Legit way of Buying Bitcoins?